The official topic of the congressional field hearing was, “The State of the VA’s Long-Term Care Services.” But it could have been called: “Preparing for The Gray Tsunami.” That’s one nickname for the growing number of aging veterans who will soon need a range of support--in some cases, 24/7 medical attention or memory care. Others may only need some help with day-to-day tasks like bathing, dressing, and getting around. 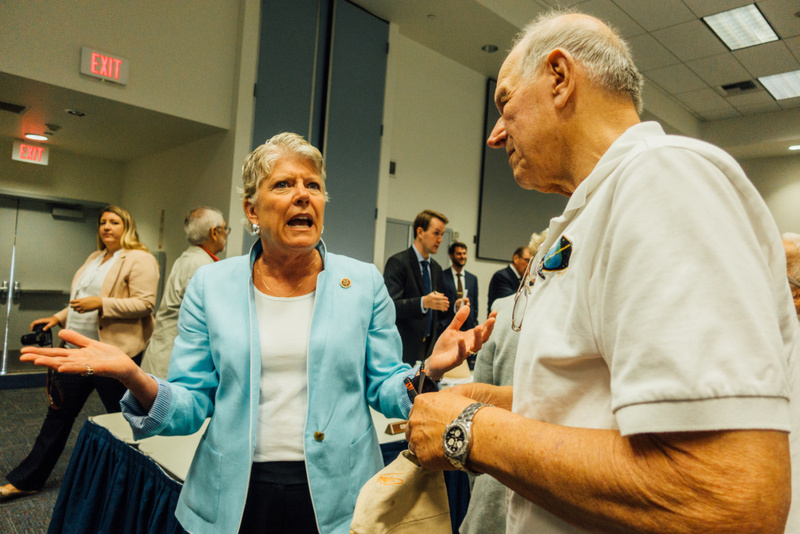 Congresswoman Julia Brownley (D-Westlake Village) speaks with attendees of a congressional field hearing on the state of the VA's long-term healthcare services. Over the next eight years, the number of veterans in the VA healthcare system who are 70 years or older is expected to increase by 30%. The population the VA is required to cover for nursing home care--veterans who have a service-connected disability rating higher than 70%--is expected to double by 2024, hitting 1-million patients. The VA simply can’t afford to care for all these veterans in traditional nursing home settings, said Teresa Boyd, the Assistant Deputy Under Secretary for Health for Clinical Operations at the agency. “With the trajectory the way that it is now, we are gonna be in a crisis with regards to long-term institutionalized care,” Boyd said. 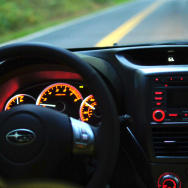 It’s a huge costs saver--but that’s not the only driver. The VA says this shift is about listening to patients. “Being able to keep our veteran in his or her home, as long as it’s safe, that’s their preference for the most part,” Boyd said. But even in the calm before the Gray Tsunami, it’s not easy to get the VA to foot the bill for nursing home care. Veterans who qualify for residential care and get to a point where they’re unable to live independently may move into a VA Community Living Center (formerly a Nursing Home Care Unit) or one of the beds the VA contracts for and inspects in private facilities as part of the Community Nursing Home program. But most veterans do not clear the 70-percent disability rating bar. In Ventura County, home to over 40,000 veterans, only about 4% meet that criteria, according to Mike McManus, Veterans Service Officer with Ventura County’s Human Services Agency. 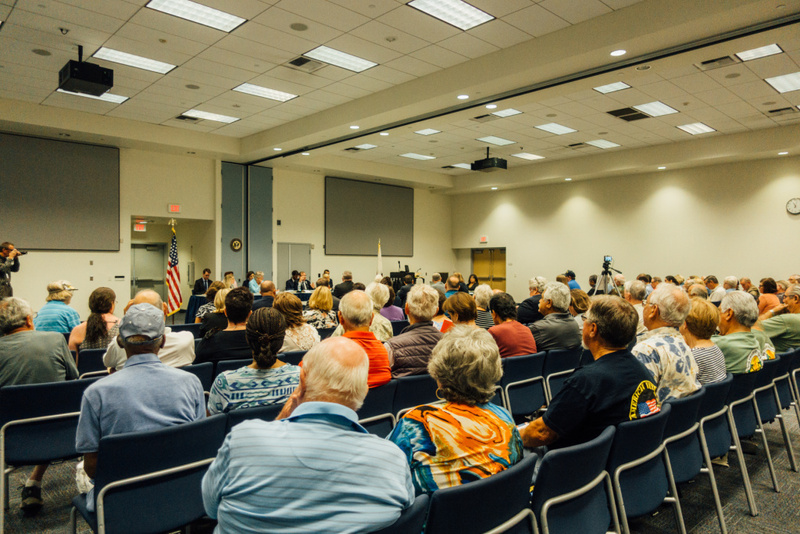 The House Veterans Affairs Subcommittee on Health held a hearing on VA nursing home care at the Ventura County Office of Education in Camarillo on July 30th, 2018. “Many vets assume they’re eligible once enrolled in VA health care, but that’s not the case,” McManus said during testimony at the congressional hearing. The VA also covers about one-third of the cost of care in state veterans homes, though eligibility requirements for those facilities vary state-to-state. 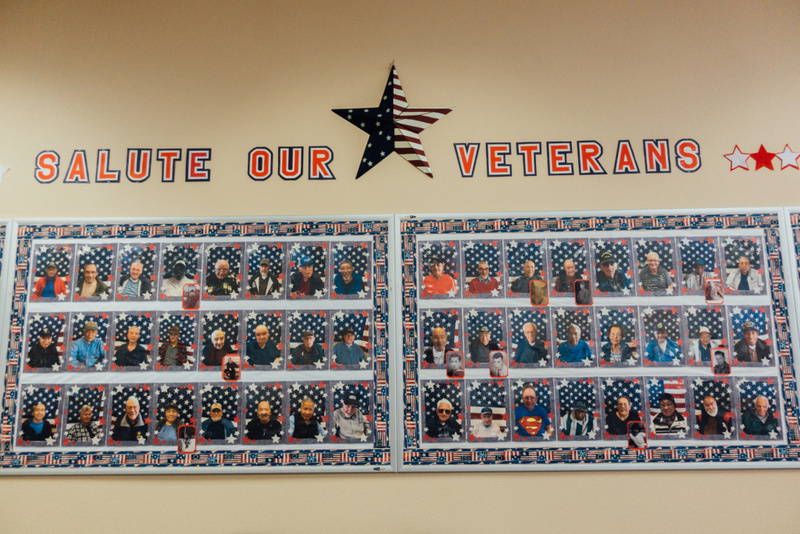 CalVet operates eight veterans homes in California, including one in West Los Angeles and another in Ventura. Keeping veterans at home longer can put a larger burden on family caregivers--often wives, younger siblings, or children--who shoulder a physically and emotionally taxing responsibility. “I really don’t like hospitals that much,” he said. 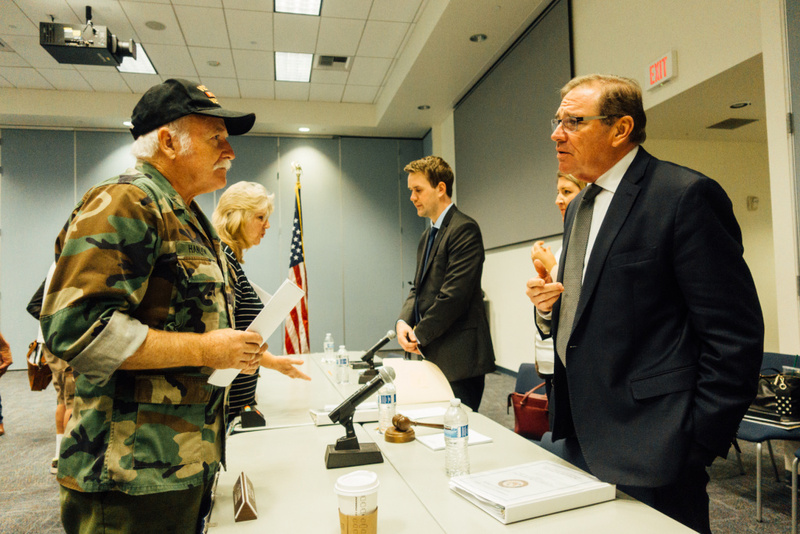 Navy veteran Charles Boyd Hanlon (left) speaks to Rep. Neal Dunn (R-FL), the chairman of the House VA Subcommittee on Health. For veterans over 65 and their spouses, who need help with daily living and qualify for a VA pension, the agency will pay an “Aid and Attendance” allowance. The income threshold for the subsidy is quite low--in 2017 a single veteran with no dependents had to make under $13,166 to get a VA pension, or be totally disabled, and meet other requirements like service during wartime. The VA is also looking at expanding services like Homemaker and Home Health Aid, which sends professionals to do things like help veterans bathe, fix meals, and take their medications, making staying at home a viable option for more seniors. Medical foster homes, where a veteran gets nursing-home level care from trained caregivers in a private home setting, are a growing alternative to the choice between institutional facilities or remaining at home. Veterans have to pay significant rent, however: anywhere from $1,500 to $3,000 a month, potentially drawn from their VA pensions, long-term care insurance, or savings. “Many of these new innovative types of non-institutional care require the veteran to pay, as the VA lacks the ability and resources to do so,” Brownley said. In a large room, mostly filled with folks in their 80s and 90s, a Zumba class dances to a catchy Reggaeton beat. Some of the participants are fully engaged in the aerobics, shaking their groove things. Others sit or lean against walkers, and clap to the rhythm instead. 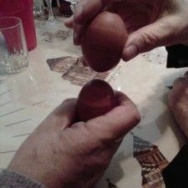 Many more hang out at tables dotting the room, doing puzzles or talking with friends. 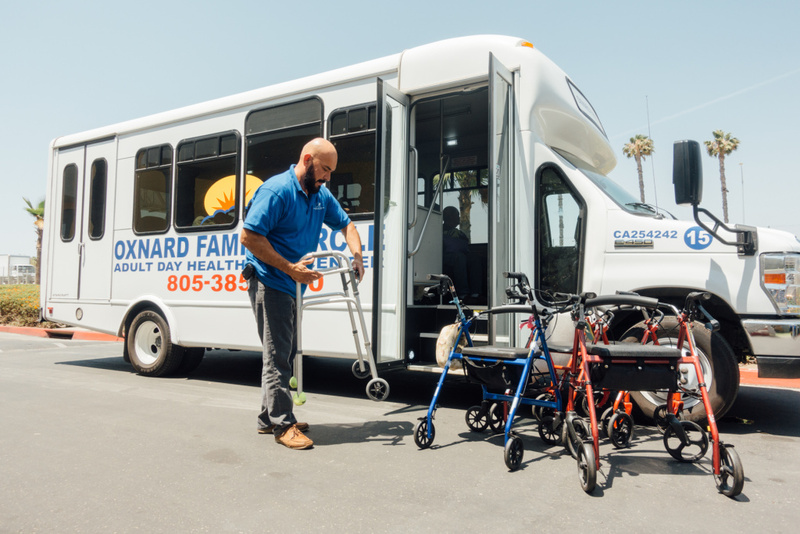 Along with its general clientele, Oxnard Family Circle serves over 100 veterans who come for about five hours a day of activities, physical therapy, and professional nursing care. Breakfast and lunch is served, and the facility provides door-to-door transportation every weekday with a fleet of buses and vans. 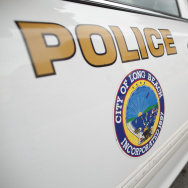 “We work with their doctors, we work with their caseworkers, so that we can provide full care all the way around for the whole person,” said Sandra Hamilton, community outreach officer with Oxnard Family Circle. The VA covers the cost of adult day health care once a doctor decides it’s clinically necessary. 84-year-old former Army infantryman Frank Acosta says he lives with his sister-in-law and his niece in the house he and his brother purchased decades ago, and coming to the center is a welcome break for everyone. 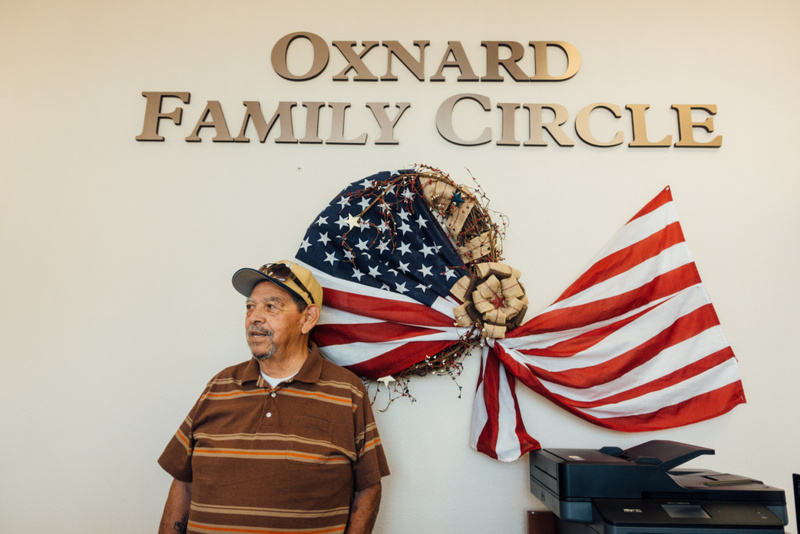 Army veteran Frank Acosta attends the Oxnard Family Circle Adult Day Healthcare program. Hattie Freeny, a Korean War-era Marine Corps vet, says she’s been coming her for 8 years. “And I love it,” she said. Freeny values her independence. Coming to this center every day gives her kids peace of mind and provides medical and social support to help her stay at home. The VA was a pioneer in developing home-based long-term care back in the early 1970s. Now it’s playing catch-up in the shift away from nursing homes. The agency lags far behind Medicaid, the largest federal spender on long-term care. More than 50% of Medicaid long-term care dollars go to home and community-based services. That number is about 30% at the VA. According to data the agency released in June, nearly half of the VA’s 133 nursing homes nationwide received the lowest possible quality rating: 1-star out of 5. Oxnard Family Circle's veteran participants. “Our case mix in our Community Living Centers is quite different than in the private sector, where they have a selection process,” Boyd said. The VA serves more spinal cord injury patients, for example, and veterans in nursing home care are more likely to suffer from severe mental health conditions than patients in private facilities. The VA’s Los Angeles-area nursing homes scored exceptionally well in the quality ratings system. Sepulveda and Long Beach Community Living Centers both received 5 out of 5 stars, while West Los Angeles was assigned 4 stars.